I am so excited about this news! Today sees the early release of a new product. Stitched Shaped Framelits. These framelits are in the Annual Catalogue coming out next year. BUT Stampin' Up! have decided to release them early. WooHoo I am so excited they have done this. Not only are stitches a classic trend, they illustrate the quality, precision, and extra care taken when creating a piece. Giving a stitched gift shows just how much you value that relationship. 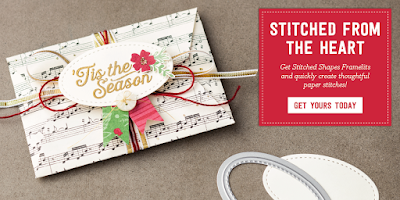 Now you have the opportunity to purchase Stitched Shapes Framelits ahead of their official release in the 2017-2018 annual catalogue and get 25% off coordinating stamp sets. With Stitched Shapes Framelits you can make paper stitches in seconds, turning any project into one that is stitched from the heart. This early-release set has 12 dies. And there’s more great news…although the 25% off stamps sets ends 30 November, you will still be able to get the Stitched Shapes Framelits after that date. Grab yours NOW and while you are it, make the most of the discount on matching stamp sets.